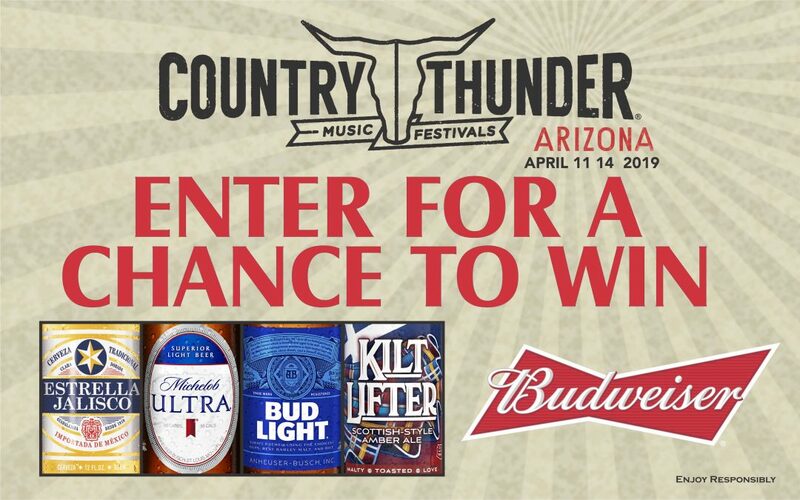 Enter for your chance to a Country Thunder campsite with two (2) four day passes. No Purchase Necessary. Sweepstakes open to residents of AZ who are 21+. Ends on 3/24/19. To enter, text “COUNTRY” to 86677 or visit http://hensley.com/budweiser-country-thunder-2019-sweepstakes and follow the online instructions. See Official Rules at http://hensley.com/budweiser-country-thunder-2019-sweepstakes for prizes and complete details. Message and data rates may apply. Participant agrees to receive a confirmation text.